With the absence of government licensing of locksmiths, The Master Locksmiths Association, a not for profit organisation established to promote the level of skills and ethics within the industry, has established its own licensing scheme whereby its approved companies are vetted, undergo regular inspections to ensure quality, and employ a lock smith with a recognised exam based qualification. How are MLA Locksmiths inspected? MLA licensed locksmith companies, who undergo strict vetting (including criminal record checks), are also regularly inspected to ensure quality etc. Company Members are meeting high standards. Each company is inspected on a regular basis, thus ensuring that its members and their operatives maintain standards in workmanship and administration. Also members are expected to conform to legal requirements and customer charters exist to ensure customer satisfaction. Inspections have the effect of making locksmithing companies more accountable for their daily operations. 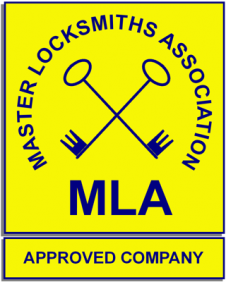 Approved Company members are made aware that the MLA considers that good quality and on going training for a locksmith is an essential means to maintaining standards and the association provides training and information through various means. The MLA Approved Company Logo is advertised by an approved company on their premises, vehicles and stationery, confirming to the public the standards expected of them.